Norwegian Hardanger fiddler of neo-folk, contemporary, classical and improvised music. He was musical director of the Ole Bull Academy in Norway for six years, has performed as a soloist with orchestras and ensembles throughout Europe, and has conducted several tours for the Norwegian Concert Institute. 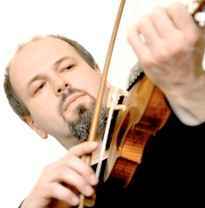 He has presented debut performances of several works for solo Hardanger fiddle and orchestra, including self-composed pieces. Økland has contributed to a number of recordings as a member of the Balkan Ensemble (1984), part of a duo (1986) with Bjørnar Andresen (Garbarek/Rypdal/Finnerud Trio), and other groups.